Internet is constantly budding with so many users and they rapidly turn towards Internet for searching information and solutions to their problems. 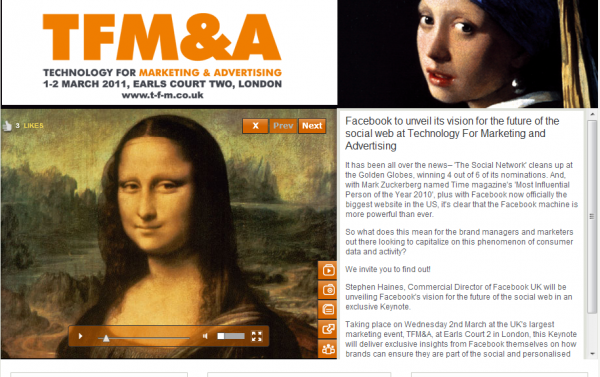 An event of technology for marketing and advertising held every year in UK. In this event different companies advertise their products and services. Many exhibitions and seminars held at this event, advertisers and marketers considers this event as the mega event for them, companies may get sponsors, marketers, customers for their products and services. Facebook has the viewership of 500 million people, to connect and conduct their business with them. Facebook is considered to be one of the most powerful social networking website ever in the history of internet; it has made the web and social life closer today. This organically growing site presents incredible advertising opportunities for companies which has certainly helped them to increase their business through this site. Brands can easily advertise their products by location, age and interests, which help them to target visitors from their own country and to market their products easily. More than 108 million people are using this site every month. The attractive features of Facebook make it the one of the best place for the companies to advertise themselves. People are expecting this is going to be a mega event soon.